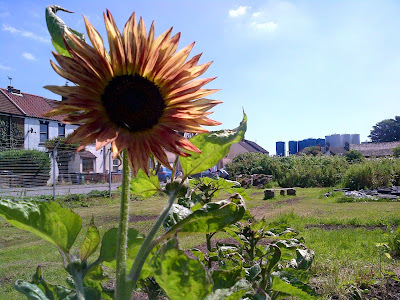 Our group has been growing sunflowers for the past few months to create a temporal sunflower labyrinth. 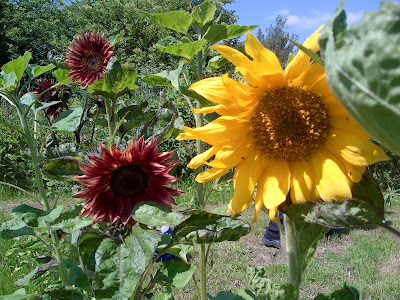 Our c. 14 x 15ft plot is now circled by a ring of colourful flowers. We're into the 2nd week of July and we've got lots of different varieties coming into flower, and they look great! As you can see from the photos, our labyrinth site sits within a much larger space. This is the previously over-grown and gone-wild part of Community Roots. 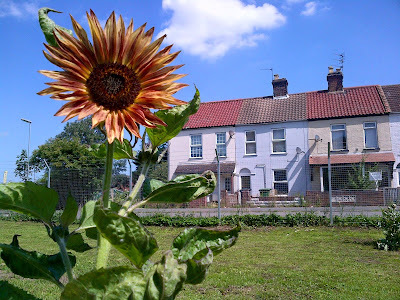 Eventually, situated across from our labyrinth, Green Light Trust and Community Roots/Great Yarmouth & Waveney Mind are developing a 'Patch Project' (mini-allotments for local people) and an orchard of local fruit varieties over the next few years. The Recovery Labyrinth Project is a new health and healing project at Community Roots, Norfolk NR31 0LE and is a seed idea of Sue Tyler of Hands on HeArt by Road to Recovery. The Project is currently in development and seeking funding for equipment and other costs to create a mosaic Labyrinth, co-designed and made by local people in recovery (from addictions and mental health issues) and our neighbours, to promote integration, better community connections and a cultural asset in an economically deprived area. Labyrinths are symbolic in recovery, but also have universal meaning in all of our lives - they differ to a maze which is about getting lost, as a labyrinth has one path and is about finding yourself. We are basing our design on the Five Ways to Wellbeing. Follow Handsonheart's board The Recovery Labyrinth Project on Pinterest. Copyright to Hands on HeArt by Road to Recovery, unless otherwise stated. Simple theme. Theme images by Nikada. Powered by Blogger.